What if I told you there was a way for you to reduce stress, increase metabolism, lower blood pressure and alleviate pain without having to go to the doctor, take medicine or undergo strenuous physical exertion? You don’t have to invest a fortune in this remedy and it is not required of you to leave the comforts of your home. It’s not an experimental new method either; in fact it has been around since 1500 BCE. If you suffer from chronic pain, high stress levels or have been unable to break free of the chains of depression or addiction then this may be just the miracle you have been looking for. If your life is simply just too hectic and you could use an opportunity to sit in peace and quiet then what I’m proposing is just the remedy for you as well. 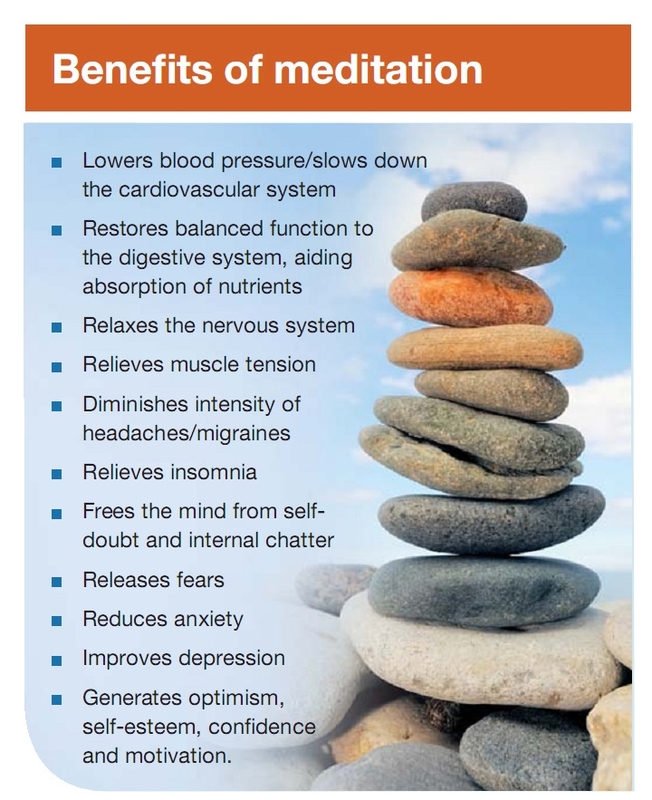 I’m talking about meditation – a natural healing method practiced and trusted the world over. The first mention of meditation can be found among the Hindu practitioners of Vedantism in 1500 BC. After that it can be found in the scripts of Taoists and Buddhists in what is known today as China, philosophers of ancient Greece, the Old Testament, Qur’an , the Benedictine monks all the way to today’s Hollywood “it” crowd devout to Kabbalah and inseparable from their yoga mats. The fact that meditation as a concept has been able to transcend religious sects and withstand the test of time are reason enough to look deeper into the possible positive effects that it may have on your health and wellness. First of all, what is meditation? Due to its prevalence in so many varying cultural settings, meditation does not conform to a set definition. In the Baha’I faith, it is regarded as “the key for opening the doors of mysteries to your mind. In that state man abstracts himself: in that state man withdraws himself from all outside objects; in that subjective mood he is immersed in the ocean of spiritual life and can unfold the secrets of things-in-themselves.” A study and review conducted in 2006 by prominent scholars Walsh and Shapiro yielded the characterization that “meditation refers to a family of self-regulation practices that focus on training attention and awareness in order to bring mental processes under greater voluntary control and thereby foster general mental well-being and development and/or specific capacities such as calm, clarity, and concentration”. The National Center for Complementary and Alternative Medicine lists “ [increasing] calmness and physical relaxation, [improving] psychological balance, [coping] with illness, or [enhancing] overall health and well-being,” as reasons for secular meditation. Well if meditation is so great, why isn’t everyone doing it? It’s true that only 9% of Americans practice mediation, and while that number is an increase from the 7% of the population in 2002 it is still a rather small share of the market that could stand to benefit from meditation. Think about it, the leading causes of death in the United States stem from cardiovascular disease, depression and stress, and while many of us are quick to reach for the “easy” solution and add another pill to our daily regimen, these are all ailments that stem from a disrupted psyche and nervous system that could stand some mental and spiritual attention. There are already so many chemical toxins in our environment which poison our natural being that adding more chemically altered substances seems to go against all grains of logic. Yet that is exactly what we do by accepting the overworked, unattached and pharmaceutical company funded doctor’s suggestion to try this course of drug A with combination of drug B and follow up in 3 months for either a refill or a new set of wonder drugs. While the positive fruits of meditation are bountiful, achieving the state of inner reflection and peace does take time and practice. In last year’s popular movie “Eat Love Pray” the protagonist quickly discovers that mediation is not as easy as closing your eyes and humming away to a newfound level of peace and understanding. Clearing the mind and focusing on your inner self is harder to do than it sounds and nearly impossible as long as the noise of the busy world around us continues to invade our inner space. Perhaps this is one of the main reasons that meditation has not caught on in the States, our society is far too loud and engulfed in all things social and busy that it is harder for us to find a place of peace and tranquility. Perhaps you will be unsuccessful in your initial attempts at achieving a state of full meditation. And while the list of above mentioned benefits should stimulate you to not give up after the first round of failed attempts, you can also seek solace in knowing that even they are helping transform and take you to a better place. Taking the time to sit quietly with your own thoughts can provide the opportunity to listen to yourself and hear the voices previously drowned out by the meaningless chatter of your superfluous and commercial needs and wants. Simply taking the time to breathe right and sit up straight can have wondrous effects on your respiratory system as well as your posture. Finally, sitting in a quiet and relaxing space will help recharge your batteries and reduce stress levels simply by taking you out of the polluted (both chemically and mentally) environment that exists in today’s 24/7, non-stop society. Meditation does not require a monthly membership, religious affiliation or a deity. All you really need is 20-30 minutes of your day, dedicated to shutting off outside distracters and focusing on clearing your mind and soul in a calm and relaxing environment. Turn off that cell phone, forget about the bills hanging on the refrigerator and the fight you had with your significant other. Forget the shopping list for this weekend’s dinner and the hole that needs to be patched up in your son’s jeans. Find a comfortable place to sit and let the natural breathing rhythms usher in a new found level of peace, relaxation and self-awareness. Make yourself open to the positive benefits of this ancient healing method and welcome in a better, healthier you.